Open Access Week was October 23-29 of this year. It’s a week promoting open access as the default in scholarship and research. The Vanderbilt Libraries hosted a number of events for Open Access Week, and one of the speakers they brought in was Nicole Allen, director of open education at SPARC, the Scholarly Publishing and Academic Resources Coalition. Melissa Mallon, director of liaison and instruction services at the Vanderbilt Library and a member of the Leading Lines team, sat down with Nicole while she was on campus to talk about Nicole’s work promoting the use of open educational resources in higher education. Derek Bruff: [00:06] Welcome to “Leading Lines,” a podcast from Vanderbilt University. I’m your host Derek Bruff, the director of the Vanderbilt Center for Teaching. [00:13] In this podcast, we explore creative, intentional and effective uses of technology to enhance student learning, uses that we hope point the way to the future of educational technology in college and university settings. [00:24] Open Access Week was October 23 through 29 of this year. It’s a week promoting open access as the default in scholarship and research. [00:32] The Vanderbilt libraries hosted a number of events for Open Access Week. One of the speakers they brought in was Nicole Allen, Director of Open Education at SPARC, the Scholarly Publishing and Academic Resources Coalition. [00:43] Melissa Mallon, Director of Liaison and Instructional Services at the Vanderbilt Library, and a member of the Leading Lines team sat down with Nicole while she was on campus to talk about Nicole’s work promoting the use of open educational resources in higher education. [00:56] As a mathematician, I appreciate a good definition, so I was happy to hear Nicole start by defining what she means by open. She goes on to make the case for open education and its benefits to students, faculty, and institutions. Melissa Mallon: [01:09] Welcome. We’re so excited to have you on the Leading Lines podcast. 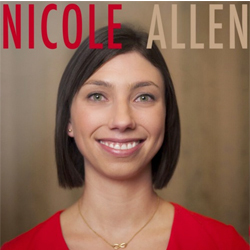 Nicole Allen: [01:13] Thanks so much for having me. It’s great to be here in Nashville. Melissa: [01:18] This might be a good chance to learn a little bit more about what SPARC is. What’s your role? How did you come to be at SPARC? Could you talk a little bit about that? Nicole: [01:30] SPARC is an international alliance of academic and research libraries, and our mission is to make open the default in research and education. We’ve seen a transformation as the Internet and technology have become regular parts of our everyday lives. [01:49] We can access all kinds of advantages through technology, whether it’s shopping, communication, or even just transportation. In research and education, we haven’t fully taken advantage of all of those benefits. We’re focused on changing policies and practices and enabling universities to move in the direction where we can really actualize that potential. Melissa: [02:19] Could you talk a little bit more about what you mean by open? I think that’s a concept that not a lot of people are familiar with, especially in terms of research and academia. Nicole: [02:30] Open means something very specific. It means free access without barriers and the right to fully use resources in the digital environment. [02:42] When we’re talking about research, it means the free immediate online availability of scholarly research articles with the right to fully use those articles in the digital environment and also to be able to access and use the data the underly that research. [02:59] Our universities are conducting research on a wide range of topics and a lot of times that research ends up getting published in journals that aren’t available to other scholars because their libraries can’t afford access to subscriptions and it’s especially a challenge when that research is funded by taxpayers in the first place. [03:21] It comes up a lot with medical research. Our government funds a huge amount of medical research, but not a lot of that is available in a timely manner. Melissa: [03:32] With your role at SPARC, can you talk a little bit about what you do there, are you interfacing with a certain community or population? Nicole: [03:41] Yeah, my work at SPARC focuses on openness in the context of education, making sure that when faculty members and other teachers are using educational resources in the classroom and engaging in educational practices, that they can harness the power of openness to help improve teaching and learning. [04:01] So when we’re talking about resources, we are talking about textbooks but also other digital learning resources that are becoming more prevalent in classrooms. Melissa: [04:10] I want to get back to that other in just a second but could we talk about your experience working with open textbooks, what does that mean? Is there a movement afoot? [04:23] We’ve had some conversations here at Vanderbilt. There are a couple of students and our graduate student association that have been doing some projects on investigating open textbooks. [04:35] I’m wondering if you could talk a little bit about what does that mean and what your work is in that area. Nicole: [04:44] The cost of textbooks is something that just about every student these days and every parent is familiar with. Nicole: [04:51] Textbook prices have risen over 80 percent in the last decade. In fact, they have more than doubled since I started college and I thought textbooks were expensive. I didn’t buy some of my books [laughs] because they were too much and unfortunately in many campuses, this is actually having a really negative impact on student learning because they are not buying their required books. [05:14] One study found that two out of every three students now says that they have skipped buying one of their books, because the cost is too high. Nicole: [05:21] Yeah, it’s just an example of how the way things have always been done, just isn’t working in today’s world with these rapidly rising prices for knowledge that is pretty well established. For example, an Intro Calculus textbook often costs over $200 and that just doesn’t make sense. [05:43] Open educational resources are focused on solving that challenge specifically starting with textbooks. Looking at publishing textbooks that can be free, and published with the permissions to fully use them in the digital environment. That’s what makes open better. Students can get access to the resource in any format they want. [06:09] Open textbooks are distributed free digitally as a PDF or HTML. They can be downloaded to different devices, but they can also be printed and sold in the bookstore just like any other textbook. [06:22] There’s one project out there called OpenStax. It’s based out of Rice University in Houston, that has published open textbooks for most of the largest intro courses. [06:34] It’s a really exciting opportunity not just to reduce costs in those courses, where the costs tend to be highest, but also to create an infrastructure where faculty can customize the resource to better fit their class. How many times have you been in a class where a professor has assigned chapters 1, 5, 6, 13 out of a 200‑page book or 2,000‑page book? [07:03] You never finished the book. With the open aspect of these resources, you as a professor actually have permission to tailor the resources to the class you’re teaching rather than trying to fit the class into the textbook you’re teaching from. Melissa: [07:19] That’s a really interesting point. I’ve seen some of the criticisms around Open Education Resources, specifically looking at things like the idea that the customization isn’t there. That it’s so general that you have to just pick and choose what’s already been created. Can you talk a little bit about some of those…? [07:48] I don’t know if criticism is the right word necessarily, but maybe some of the concerns that faculty might have about OERs and how do they fit into this world of very highly and specialized curriculum. Nicole: [08:06] It’s funny to hear you say that. Actually, one of the criticisms of traditional in publish material is that they tend to be built to the lowest common denominator. Nicole: [08:15] [laughs] In a world where education isn’t one size fits all, whether you’re at a community college or a prestigious institution like Vanderbilt. [08:23] It’s important for educators to be able to customize their materials to fit what they’re teaching and put their own particular spin on the course. With traditional materials, you’re locked into whatever is there. Even if the publisher allows you to make some customization, those aren’t your customizations. [08:47] With open resources, you can actually help shape a resource that can evolve over time that your students can keep forever, and that you as an expert in the field and as an instructor can make as a contribution to the field that you’re teaching in. Melissa: [09:06] That’s a really interesting piece of it. I think the focus on using OERs often fits in that realm of teaching and learning. [09:16] Do you have a lot of experience or have you talked with the faculty about creating OERs as a research product? I know that there are some universities that are starting to maybe even look at that as an option for 10‑year outputs. Do you have any thoughts on that? [10:03] But also, allows the project to improve the resources over time, because if you have thousands of students going to the course, you can collect a lot of really valuable data about what is effective, what isn’t and then draw broader conclusions about how questions can be structured in instructional psychology that can actually inform better the field of teaching and learning field of scholarship. Melissa: [10:29] I love that and I love that there is that…There is a research scholarly aspect of creating these courses and pulling the data to inform learning sciences. Also, it sounds like they’re still focusing on the learning experience for students. They’re not letting that piece go. [10:53] That would be another question that I think if I was faculty member wanting to use an OER or maybe an open textbook, something like that, is thinking about how it might impact student learning and what the student perspective might be. Have you talked with students about their engagement or preferences with open resources? Nicole: [11:20] Yes. There is a growing body of peer‑reviewed research that looks at student perceptions and student outcomes regarding open educational resources. [11:39] So far, it’s found across the board that students tend to do as well or better when they use open educational resources and appreciate the features of flexibility. You’re getting access to the content in a variety of different formats. Right now, with traditional resources, you have to choose. It’s print or digital. It’s not both. Melissa: [12:08] I like it. Nicole: [12:09] …and really benefit from it. [12:13] The open environment just creates so many opportunities for innovation in teaching and learning. One example that comes to mind is Professor David Wiley at Brigham Young University. [12:27] He was teaching upper‑level graduate course on project management for instructional designers in their school of education and there is no such textbook. What he ended up doing is taking an open textbook in general project management and actually working with the students to turn it into a textbook for project management, for instructional design. Melissa: [12:52] So they’re really able to select the resources and content that they know will help them in that course. I love it. That’s a great Idea. Nicole: [13:01] They’re learning the subject by doing and creating a resource that can inform future generations of that course. In fact, the future classes look back on the work that their peers did originally and critique it and improve it and add to it. [13:19] One of the exciting things is that ‑‑ these are grad students, they work in the publish ‑‑ they get to add their names as a co‑contributor to a published work. Nicole: [13:29] It’s just a really cool illustration of what is possible in the open environment. Not every professor wants to teach that way, but that’s just one small example of the kinds of things you can do with open pedagogy. Melissa: [13:44] I love that. It has such a participatory feeling and culture that moves beyond just work on this project that doesn’t have a direct impact with what you’re doing and where you’re going. That’s a fantastic example. [14:02] What about the faculty members that maybe are a little bit more cautious. They haven’t used open educational resources before. They’re not sure how to get started. Do you have advice for…even where to find examples or how you might go about starting to customize for your own courses? Nicole: [14:22] Yes. I should note that this varies a lot by discipline. The example I just gave, it’s not going to look like that in the sciences, but there are other exciting ways to structure courses in ways that engage open pedagogy. For example, structuring a class around solving one of the global grand challenges. [14:41] To answer the question about faculty who are getting started with open educational resources, the great thing is that you don’t have to take advantage of all of the open aspects of it. There are plenty of open textbooks and other resources out there that you can use literally off the shelf. [15:00] The project OpenStax that I mentioned earlier is just a good example of that kind of textbook. They make it really easy to customize the textbook in their online platform and they actually work with commercial partners that offer a set of add‑on items. [15:18] One of the things especially in introductory courses that’s become increasingly common is homework software or tutoring programs that add value to the text for students and teachers. By offering those partnerships, a professor can use an open textbook pretty much just like a traditional textbook, and that’s a great place to start. [15:43] I should also mention that there are other ways to move toward openness and take smaller steps. For example, working with your library to make sure that if you’re assigning a course pack or readings that you’re not duplicating resources that are already available in the library. Nicole: [16:08] I should also mention that I was not coached for this. Nicole: [16:16] But it’s true. You’ll find examples where students are picking up a course pack at the bookstore that contains articles that the library has already paid for. They’re actually paying twice for the articles in there. [16:30] It’s a small step toward openness but one that can make a really big difference for students. Likewise, just looking across the resources that are being assigned in the course to identify ones that there are open alternatives for. [17:10] Moving in the direction of models that help ensure students get access to their materials in a sustainable and permanent way is really important. Melissa: [17:20] And remembering that if the perfect thing isn’t out there, you can always create it. That’s great. [17:28] I also was hoping that you could talk a little bit about the work that you’ve done with OpenCon. I’m really interested in that just from my library perspective, but I think it’s a really good example of supporting open research. Do you mind talking a bit about that? Nicole: [17:47] Yeah, so I understand that there is an OpenCon satellite event happening in Nashville this week hosted by Vanderbilt, which is very exciting. The idea of OpenCon, it’s the conference and community for students and early career academic professionals on open access, open education, and open data. [18:07] My work with OpenCon, I’m one of the team of people who work to organize the meeting. The idea behind it is that students and the next generation of leaders understand openness in a really organic way. [18:26] Open is the way that the Internet and the technology‑enabled world should work. It’s the state of nature, and then there are all of these structures that make it harder. [18:38] What can we do as the people who are going to inherit this world as the tenured professors of 40 years from now and the university librarians and the policy makers… What can we do to help make sure that the world that we inherit is open and takes advantage of all of these pathways? [19:00] I personally started out as an open advocate myself, as an undergraduate student frustrated with the cost of textbooks. I was the kid who was not buying my textbooks and trying to get by using Wikipedia instead. [19:16] I just didn’t understand — I went to a private liberal arts college — I didn’t understand why this 21st century education that cost a whole bunch of money, why the materials I was using are these often out‑of‑date, bound, really expensive resources when there’s a wealth of information available on the Web. [19:41] Of course, that’s a student’s perspective, not necessarily a statement on pedagogy, but that’s how I viewed the world. Melissa: [19:49] I think that has implications for the idea of student as advocate, that they can really take control of their own learning experience and if they know of resources that are out there, if they’re going to OpenCons and they’re a familiar with all different open pedagogy techniques or resources, take that to your faculty members. Let them know that this stuff is out there and that you don’t want to have to spend hundreds of dollars on a single textbook. Nicole: [20:21] Yeah. It’s true, although different students are in different places. There’s a study after study that still shows that most students prefer to read in print despite the fact that millennials are using technology in their everyday lives at least in the developed world. [20:39] Digital literacy isn’t always there. There’s important work to be done there, and the concept of building leadership amongst the next generation is really, really important. That’s what OpenCon seeks to do. [20:57] It’s an annual conference that we organize with people from all around the world. We run an application process and provide scholarships to people because students and young leaders often don’t have access to funding of their own. [21:12] Last year, for example, we held the meeting in Washington, DC and had over 60 countries represented. Melissa: [21:18] Wow, that’s fantastic. Nicole: [21:20] People from Bangladesh, Nigeria and Argentina are just doing amazing work toward openness in their community ‑‑ people who work for prime ministers, or who are researchers, or who are building education programs or even pop‑up Internet cafes in sub‑Saharan Africa. [21:47] When you get a group of people like that together, it’s just almost magical. The kinds of projects that come out it are just incredibly exciting. Melissa: [21:56] Yeah, that’s fantastic. To have students and future educational leaders there altogether, to be able to see that this is not just an issue or a movement in the United States, but it’s progress really. That’s fantastic. Nicole: [22:15] Yeah and it plays out differently in different places, because open means one thing in the United States, it means something different in Nigeria in terms of how it’s put into practice. The more that we can exchange information about how different societies are moving toward openness, the more we can support each other. Melissa: [22:38] That’s great. On that idea of supporting each other, are there other suggestions or guidance that you have for anyone ‑‑ faculty, students, librarians ‑‑ that are wanting to try to increase their use of open education resources on their campus? Do you have some maybe first steps that you would suggest? Nicole: [23:03] I think it’s important to look at it as a process. It’s going to be easier in some places than it is in others. When I look at some of the most successful campuses that have open education initiatives, it often starts with the library. Nicole: [23:22] It’s often a few faculty members who are the early adopters and leaders who are in a position where they either have the time or have access to a particular resource that’s a good fit for their course or actually invest the energy in producing a resource of their own that they want to make sure gets out to the world, who help move the campus along toward openness. [24:23] There are still a lot of areas that need to develop. It’s an arc toward openness, and I’d say that raising awareness is the first step. [24:36] Just having these conversations, whether it’s a student sitting down with the faculty member and talking with them about how textbook costs are impacting them and encouraging their faculty members, of course respectfully, to seek out open alternatives. [24:54] And librarians thinking about how you can work into the conversations you have a faculty every day, openness, whether it’s around research or educational materials or data. [25:04] And then faculty members just looking at the resources you’re teaching with. Can you make small changes that make the resources more accessible and usable and affordable to students? Melissa: [25:41] Exactly. Just that building awareness of what we have on campus already, the resources that are available. I’ll put in a plug for our amazing scholarly communications librarian, Elizabeth Shook. [25:53] She is very interested in this area, and I know that she’s working to build more resources from the libraries to be able to help that. There’s an Elizabeth on every campus and in every library. There definitely are resources out there. [25:13] Nicole, this has been fascinating. Do you have anything else that you want to add or any last words of wisdom or excitement for [laughs] open access? Nicole: [26:25] I think one last thing that I’ll just mention is that I know Vanderbilt is thinking about ways to expand its impact in the world, and I think openness is a really exciting opportunity to do that. [26:39] There have been all sorts of studies to find when you publish articles of open access that they get cited more. With educational resources, you’re going to reach so many more people than you would otherwise by publishing those resources openly rather than a traditional publisher, where only a couple thousand students are ever going to benefit from the resource. [27:00] Openness isn’t just about the benefits to the users. It’s also about the benefits to the creators. The more that we highlight that, and I think from an institutional perspective, to be able to showcase the amazing scholarship and teaching that’s happening here to the entire world is a really important opportunity. [27:23] As those conversations continue here, really think about how open fits into your mission and it helps expand the impact that this institution has in the world. Melissa: [27:35] That’s fantastic. Thank you. Before we wrap up, one last question that we like to ask everyone on the Leading Lines podcast, do you have a favorite non‑digital or analogue educational technology? Nicole: [27:52] When we’re talking about openness, open is a concept. It doesn’t apply to the final format that you get. It can be a printed textbook. It can be a digital file. It can be an audio file. [28:07] We live in the digital age, but print is still a really important educational technology. Technology has changed how we consume print. For example, you can have a machine that literally prints out a textbook right on campus. I think print is here to stay at least for the short term. [28:27] It’s important for us to think about how to make sure students have access to that format. Melissa: [28:33] I think that’s a great answer, and like you said earlier, there are a lot of students that still prefer having a print textbook. They want to highlight. They want to make notes. Even if that means having the ability to print out a digital textbook file or whatever that looks like, that’s such an important thing. Nicole: [28:55] One thing that comes up a lot in educational policy discussions is the digital divide. Not all students have equal access to technology. [20:03] As we take advantage of all of the opportunities of technology, we need to make sure that we’re still making accommodations for those students who aren’t there yet, who don’t have Internet access in the home and don’t have digital devices. Print is still a really important part of that. Melissa: [29:22] That’s fantastic I think that’s a really good cap to our interview here because it is important to remember the whole point of this movement is to make educational materials accessible and available to students. That might mean not necessarily digital. Nicole: [29:39] Using the power of technology but not necessarily delivering it digitally. Melissa: [29:43] Love it. That’s a great a catch line and I think a great spot to end on. Thank you so much, Nicole. It was a real pleasure to talk with you today. Nicole: [29:52] Thanks so much. It’s been a great conversation. Derek: [29:58] That was Nicole Allen, Director of Open Education at SPARC. Thanks to Melissa Mallon for interviewing Nicole and to the Vanderbilt Libraries for hosting her. Check the show notes for more information on Nicole’s work at SPARC. [30:09] I used an open textbook in my statistics course a few years ago. It wasn’t the best textbook ever, but it was good enough for a pretty standard intro stats course. My students definitely appreciated it since they could download the PDF for free or pay $10 for a paperback copy via Amazon. [30:23] It was open source, too. I didn’t have the time to remix it or write my own chapters, but I could have if I had wanted to. I’ve been wondering why we don’t see more adoption of open textbooks in higher ed. [30:32] As Nicole Allen points out, they have significant advantages for students and faculty. I suspect the lack of adoption stems from the fact that many instructors are really selective about the textbooks they choose. [30:42] It’s not that open textbooks don’t have sufficient quality, many of them are quite fantastic, but perhaps there’s not enough variety for instructors to find just the right open textbook that matches their course. [30:51] I know I’m really picky about the textbook I use when I teach linear algebra for instance. I have about 20 linear algebra textbooks on my shelf but there’s just one or two that I would actually choose to use in my class. [31:00] Perhaps the work of SPARC and OpenCon and other folks working in this area will help with this over time and that we’ll see more variety in the types of open textbooks that are available for faculty and that in turn might lead to more faculty adopting them. [31:15] If you have thoughts about open educational resources and what it would take to see their use grow, let us know. You can leave a comment on our website, leadinglinespod.com, or connect with us on Twitter where our handle is @leadinglinespod, or, and this is still new, email us a voice memo at leadinglinespod@vanderbilt.edu. [31:31] We’d love to hear from you. [31:33] Leading Lines is produced by the Center for Teaching, the Vanderbilt Institute for Digital Learning, the Office of Scholarly Communications and the Associate Provost for Digital Learning. This episode was edited by Rhett McDaniel. [31:42] Look for new episodes the first and third Monday of each month. I’m your host, Derek Bruff. Thanks for listening.